The Methow Salmon Recovery Foundation (MSRF), in partnership with the Bureau of Reclamation (Reclamation), Bonneville Power Administration, Washington State Department of Fish and Wildlife (WDFW), and the Upper Columbia Salmon Recovery Board (UCSRB) constructed two habitat projects along the Methow River between 2012 and 2013. These two projects, Whitefish Island and WDFW Floodplain, are part of a larger, long-term effort to benefit endangered and threatened species of fish in the Methow River between Winthrop and Twisp. Reclamation completed an extensive three-year study of the Methow River from Carlton to the Lost River above Mazama and a more detailed study of the Middle Methow (M2) between Winthrop and Twisp. These studies found that the M2 has good potential for successful habitat improvement projects that would yield tremendous benefit for listed fish species for the effort and cost involved. 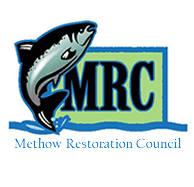 MSRF serves as a local sponsor to Reclamation to ensure that projects proposed in this reach support locally developed restoration plans and are completed in coordination with other restoration efforts. The two M2 projects completed between 2012-2013 were extensively reviewed and are supported by the UCSRB. In coordination with these efforts, the Yakama Nation is sponsoring additional projects in the M2, between Lewisia Road and Twisp. Both of these projects will create better in-stream and riparian habitat for young salmon and steelhead during their critical first year. install larger capacity culverts for better habitat connectivity. While the primary goal of these M2 projects is to improve habitat for juvenile fish (resulting in an increase in the numbers of surviving fish that will later return as adults to spawn), these projects will also improve habitat for many other native species and help restore natural river processes. Streamside plants like willows, cottonwoods, serviceberries, and hawthorns will benefit many species, including birds, deer, small mammals, and reptiles. Off-channel areas will support wetland species, such as beavers and frogs, as well as provide floodwater storage. Improved riparian vegetation will also help reduce riverbank erosion. Construction at Whitefish Island, off Witte Road, began in August 2012 and was completed in early November 2012. Work took place in the side channel, on the island, and in the floodplain on the west side of the river. Construction at the WDFW Floodplain site, off Old Twisp Highway and Evans/Lewisia Road, took place from mid-August to mid-September 2012 and from July through October 2013. Construction efforts in 2012 took place on the east side of the river, on the bank below the Methow Valley Irrigation District east fish screen, and in the main channel near the old diversion dam. In 2013, construction work took place on the west side of the river in the main channel, the side channel and in the floodplain. Monitoring, weed control and restoration of native plants in the riparian area will continue for at least three years after construction. Please contact Michael Notaro with any questions regarding either project.